It would be safe to say that the Irn Bruisers found their game in Ireland on Saturday challenging. The prediction beforehand was for a Dublin win, and they stamped their mark on the game from the very start. 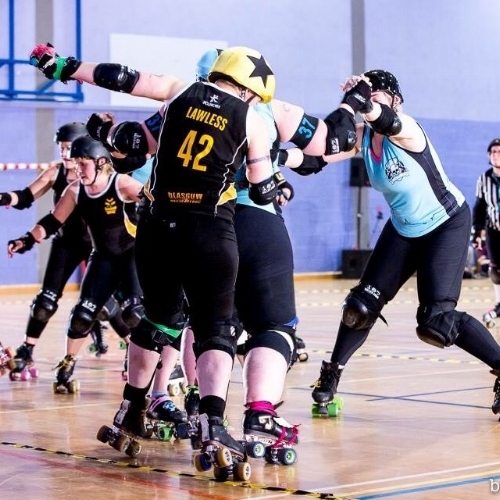 Devil's Advoskate tricked by a wily Dublin jammer; photo courtesy of Alastair McAleese. Dublin A established a big lead early on, with the scoreline sitting at 63-0 in their favour early in the first half. Glasgow fought back to stick some points on the board but Dublin certainly didn't make it easy for them, 131-16. The Bruisers struggled onwards for every point, and ended the first half with the score 172-27 to the home team. With their opponents sitting in a dominant position after the break, it was all uphill in the second half for the Bruisers. They dug in and managed to sneak some more points past Dublin A, but for every point the Bruisers squeezed out of them the Irish skaters piled on even more and early in the second half the scores were 228-49. Despite our skaters' best efforts, the home team pulled further and further ahead and won comfortably. Sarah McMillan fighting through the Dublin blockers; photo courtesy of Alastair McAleese. This was the Irn Bruisers last game of the season, and they're now taking a month break from training before getting back on it in December to come back stronger in 2017. Watch this space for more news on planned events for next year. For your next roller derby fix, why not come along to our Home Teams Final on Saturday? First-time finalists the T-Wrecks will be facing last year's winners the Bad Omens to see who will be crowned champions - go here for more information and to book your tickets! Game poster for Dublin A vs Irn Bruisers; courtesy of Dublin Roller Derby. Remember, remember the 5th of November (which isn't hard as it's only in two days time as I write this, and even my attention span isn't that short) - our Irn Bruisers are taking a short trip over the sea to face up to Dublin Roller Derby's A Team. The teams last played each other two years ago, 8th November 2014, when the Bruisers dominated the game with the score 118-29 at half time, and the Irn Bruisers taking the win 249-82. Our team has seen a lot of change in recent times, with a number of notable departures but also plenty of new talent. Over at the Scottish Roller Derby blog, they're predicting an Irish victory and certainly that's what the current stats would support. They have eleven members on the Team Ireland training squad and have had a pretty strong season, but our Irn Bruisers won't make it easy for them. We've got plenty of fight and we're packing it all with our skates, safety gear and clean underwear ready for the weekend. The game starts at 1pm, and will be live-tweeted from @DRDscores so if you can't be there onthe day you can keep up to date with all the action. Hey ho GLASGOW! It was one sunny September morning when a bunch of tough women in yellow hopped in the back of a minibus, drove to England and turned left towards that haven of brown ale, black & white stripes and people unfamiliar with outerwear. We'll gloss over how long ago it was because Team Blog have clearly been neglecting their duties due to being on important business...in Zurich. Or something like that. The Bruisers last met the Canny Belters on home ground back in February, as part of the British Championships Tier 1 tournament which was so successfully hosted in part by GRD. That game ended in a win for the visitors, with the scoreline 109-238 in the Canny Belter's favour. So the Irn Bruisers had it all to play for, but would the Belter's home ground advantage prove too much for them? Sarah McMillan skipping up the inside line to avoid a hit from Anita B Nasty; photo courtesy of Dave Moore. The Irn Bruisers line up has seen a lot of flux in recent months, though there are plenty of familiar faces. Despite putting up a fierce fight, it just wasn't enough against an incredibly strong Newcastle team and the home team took the win. Bruise Missile fighting to get past the fierce defences of Missy Pow Pow; photo courtesy of Dave Moore. #TBT to ECDX 2013. Marshall Lawless was trying to cool off in the baking Brooklyn heat with some local kids and their conveniently broken fire hydrant. While we are really excited to see and play our long time friends from Rainy and Tiger Bay, we know that trips away from home take some special preparation. Going away with a team is very different to most other adventures you might go on in your leisure time so we've gathered some tips from skaters and officials to make sure you can put your best skate forward when on the road. 1. What's the absolutely critical item that you need to bring with you when travelling? Siobhan Sinclair: My iPod and a book for the journey! Candy Moho: Food (lots of), ipod and a copy of the rules. Jeneral Strike: Book to read! then I can never be bored. Cara Viola: A folder with all the information in it that I will need for my trip. Not an exciting answer but if I have all the info it keeps me calm. Sarah McMillan: My bruisers lanyard from 2015, which has a card on it with a lot of really lovely things my teammates said about me; it reminds me that even if I don't feel good about my derby, others see differently! Thank goodness for team mates!! Sadie O'Hades: Audiobooks on my mp3 player. My knitting! And I have a lucky hippo that my grandma gave me that always travels with me. 2. Front of the bus or back of the bus? CM: Front, in a seat by myself so I can be antisocial and spread myself out. SM: Back of the bus, lying along all the seats ideally! 3. Sleep all the way or party bus? SS: Sleep most of the way usually! JS: Usually party, I like the distraction. SOH: Sleep or quiet things like read. 4. What about snacks or food or drinks, is there anything you always bring from home just in case? SS: Always bring on the plane/bus a bottle of water, bottle of irn bru and a packet of mento (I LOVE mentos). CM: I bring all the food in case I can't find any vegan food (will usually always have a huge tub of pasta, snack bars and roasted nuts). JS: I bring as many snacks as possible, I'm too tight fisted to want to buy much. CV: These days its hydration tablets and Naked bars. SOH: TEABAGS. Megan Hyndman recommend this to me recently and she's very right, can't leave home without them. I also like to bring a nice filling sandwich in case I don't have time to find anything else. 5. Any top tip or funny story you could pass on to reassure someone who's never travelled with a team before? SS: Top tip: Travel with Cara Viola and ALWAYS bring a jacket even if you think the weather will be warm (ahem Malmo..). CM: Don't get drunk on the bus, it's a long way home. JS: Hmm, I've not done it so much. Maybe look forward to getting to know your team mates better. CV: If possible travel with a buddy or in a group. That way if something goes wrong then you can tackle the problem together. SM: We are so lucky to be involved in a sport that we get to travel to play; it's not a holiday, but you should be aware of how hard you've worked to get there and enjoy the experience! SOH: Check out any travel connections you need to make before you go so you minimise confusion at important connections. Also, if you travel with a novelty suitcase that makes noises prepare to hear that A LOT before the end of your trip... On the Malmo trip one of our skaters had an R2D2 case that beeped and was super cute at the start but got very vocal as time went on! 6. What's the farthest you've travelled with your team? SS: Malmo, Sweden and Nantes, France (Think they are similar distances away). CM: Berlin, and Telford is probably the longest bus trip. SOH: Malmo, Sweden. Excited to find out where derby will take me in future. 7. What is the best derby-related trip you've ever been on? SS: Nantes with the Maidens in 2015! Was the funniest roller derby trip I have ever been on and as a brand new Maiden at the time I got fantastic tournament experience and the trip was a fantastic bonding experience for the entire team as we all stayed in the same place and hung out as a team the entire time! It was just AWESOME!!!!! CM: Several spring to mind, London for Roll Britannia in 2009 cheering on GRD and ARRG when I was in GCRG, EROC is a good trip, and some good bootcamps. JS: I've had a great time going to watch games- less nerves just the fun of a road trip! CV: The first time the Bruisers went to the states to play at ECDX. It was a pretty big deal for us to travel this far and complete with American teams. It’s also a pretty awesome tournament. SOH: My first derby trip was a really fun one. I travelled with the Maidens to Granite City long before I was bout ready myself. The bus was great, very fun and we even had ice cream and walked along the beach before we came home! Kitty Slyde showing that good things can come in small handluggage on GRD's trip to Nantes in 2015. As you can see, everyone's got a different idea about what they need to bring and do for the best time while on the road, but what we all have in common is how much we love that our sport takes us to wonderful places. What do you think makes derby trips special? If you've any tips to share please leave them in comments section, we'd love to hear from you. Disappointed you won't make it to see us in Manchester? Never fear, catch us on home turf next weekend instead. Tickets for our Home Teams Season Opener are on sale now for just £6 in advance!